I have a lot of cookbooks. Not as many as some people I’m sure, but I still have a plethora. I have old ones, I have new ones. I have thin and thick, tall and small. I used to collect them simply because family and friends knew that buying me a cookbook was an easy Christmas or birthday gift. Eventually I realized this could get out of control and I said, no more cookbooks! Sometimes I still pine for more when flipping through the glossy pages of a new one at Brookline Booksmith – my favorite bookstore. So what to do with all these cookbooks? After talking with someone this past week who herself was trying to make better use of her collection, I decided that I need to cook from my cookbooks way more often. These days, I tend to go to the internet when I want a new recipe (or when I want to share a recipe – hello blog!) and my poor cookbooks are just taking up space on my bookshelf. 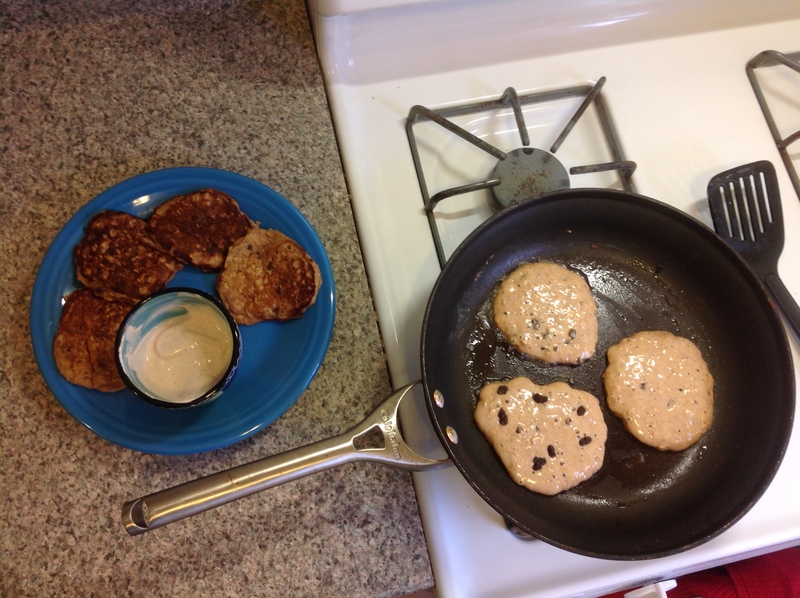 Oatmeal raisin pancakes for breakfast with cinnamon sour cream! So I decided to do a cookbook challenge. I will make at least one recipe out of every cookbook that I own for the next several weeks (months? years?) until I get through every last one. I am still allowed to use the internet for a few recipes here and there, but the majority of my recipes will be from cookbooks that I own. 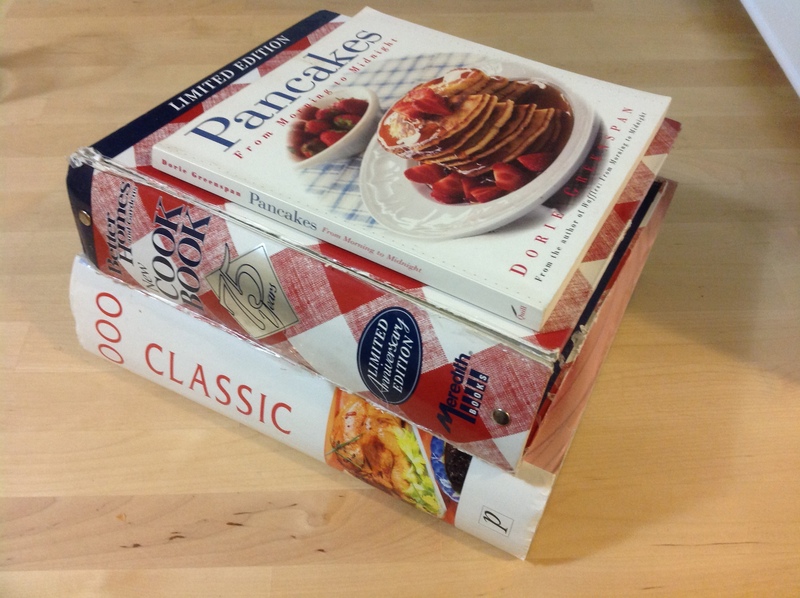 This way I can still expand my recipe repertoire (as many of them have never been used!) and give my collection of cookbooks a little love. I started my challenge yesterday, making oatmeal raisin pancakes with cinnamon sour cream for breakfast (pictured above). This recipe comes courtesy of Dorie Greenspan from a small book of pancakes I picked up at a used bookstore in Maine while visiting my aunt and uncle’s summer cabin. 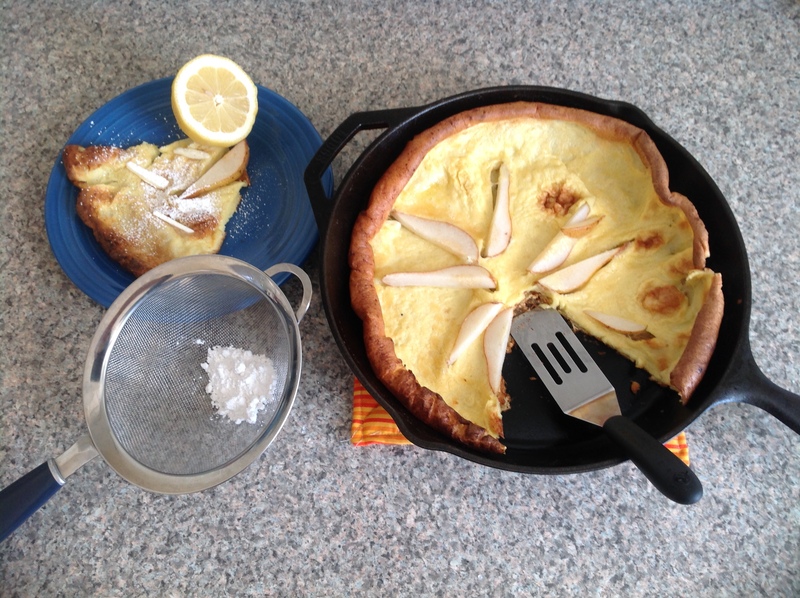 I altered the recipe slightly and the pancakes and sour cream topping turned out delicious! For the sour cream: Mix 1/2 cup sour cream, 1/2 tsp. cinnamon, and 2 tsp. brown sugar and set aside. For the pancakes: mix all of the dry ingredients (flour through baking soda) in one bowl. Mix all of the wet ingredients (butter through egg) in another. 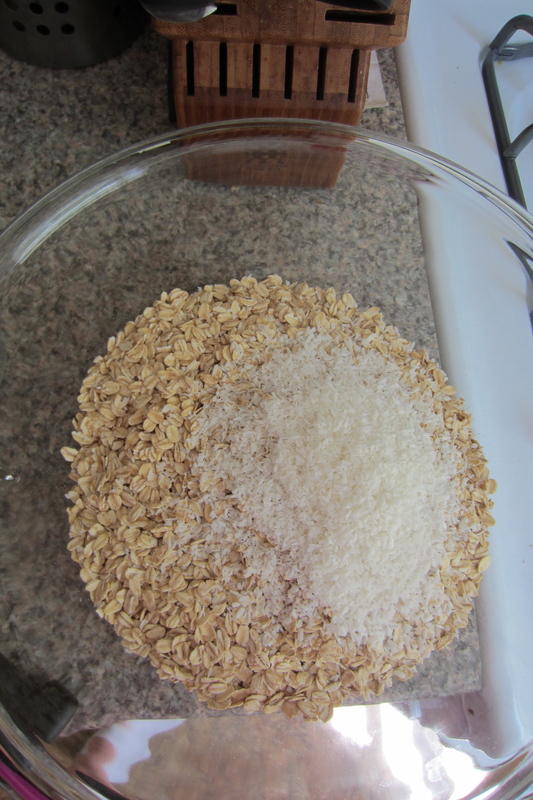 Add the wet to the dry and stir just enough so that all of the dry is moistened. Fold in raisins. Allow the batter to sit and absorb the liquid for 10 minutes. Preheat a pan or griddle to medium-low as you would for pancakes. When the pan is hot, add the batter in 1/4 cup ladles and cook for a few minutes until bubbles form. Flip and cook another minute more. Remove to a plate and serve with cinnamon sour cream. Repeat with remaining batter. Now don’t think I stopped at one recipe for the day. After all, the day had only begun. For dinner I made Salmon in Phyllo (Filo) from the Better Homes and Gardens 75th anniversary cookbook. 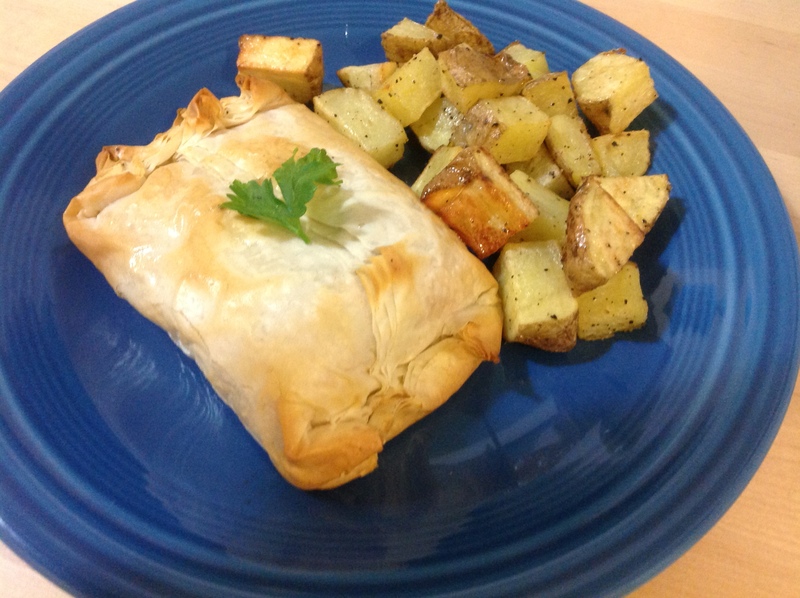 I had originally planned to make a steak and ale pie using the phyllo in honor of Pi day, but I ended up changing my mind. 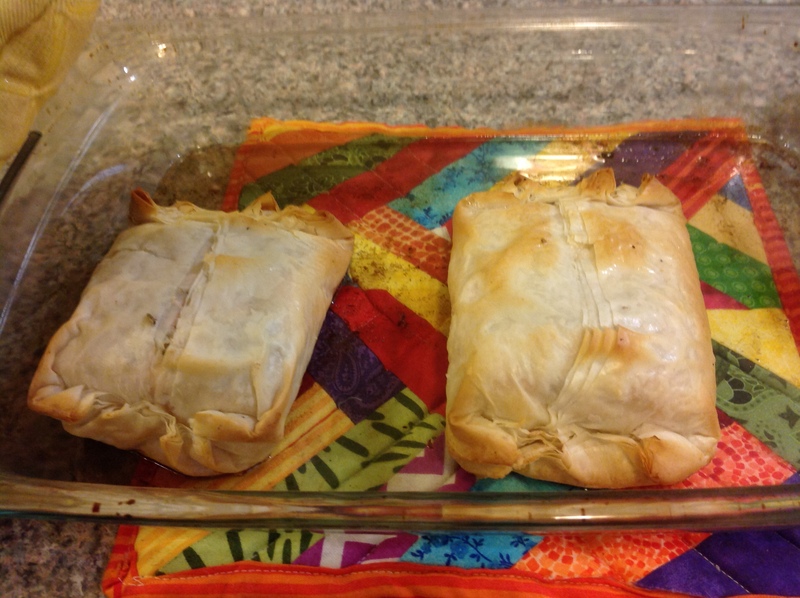 To use up the already thawed phyllo, I decided a sort of Salmon en croute would be delicious. These pretty fillets were topped with rosemary, salt, pepper, and don’t forget BUTTER – whoa nelly! Wrapped up in pretty little packages, I tucked them in the oven to brown. 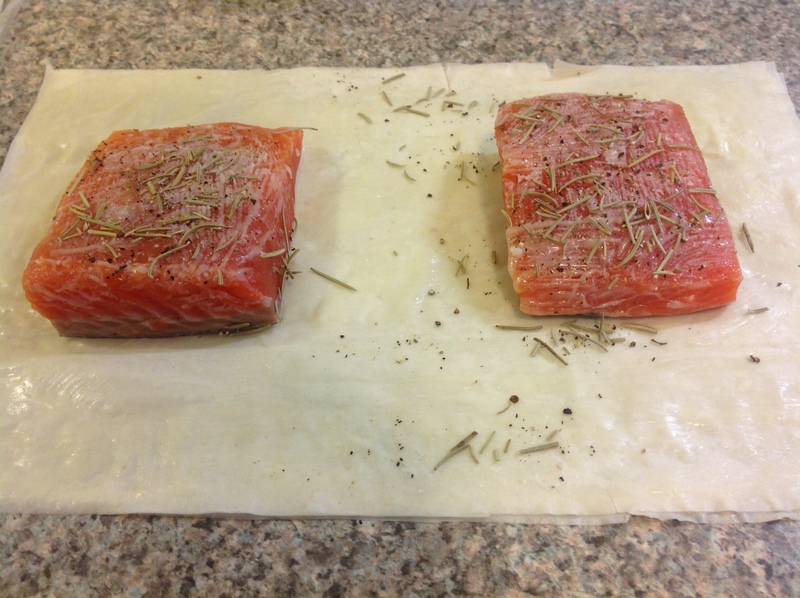 The salmon and phyllo were flaky and wonderful, flavored nicely with the dried rosemary. Perhaps because of all the butter, the fish was very filling. I served it with roasted potatoes and as always a green salad. Preheat your oven to 400 degrees and lightly butter a medium sized oven-safe dish. Cut your salmon into two equal size pieces if it isn’t already. Pat dry with paper towels and season with salt, pepper, and fresh or dried rosemary. On a clean surface, lay out your phyllo dough, one layer at a time, brushing each with butter before adding the next layer. When all layers are done, add your salmon pieces on top, spacing them evenly apart. Using a sharp knife, cut the phyllo dough to separate into two pieces for each piece of salmon. Fold two opposite sides over the fish, brushing with more butter as needed and roll or tuck up the ends to make a package. Place in your oven-safe dish and bake for 18-20 minutes depending on the thickness of your fish. If it is an inch thick, 18 minutes is perfect. It is hard to check the doneness of the salmon though since it is wrapped in the pastry. You can cut into it if you are worried about the fish being done. Serve with mustard or a mustard cream sauce (as recommended in the book). Since we don’t usually like to eat leftover fish, I made one more dish (from yet another cookbook!) 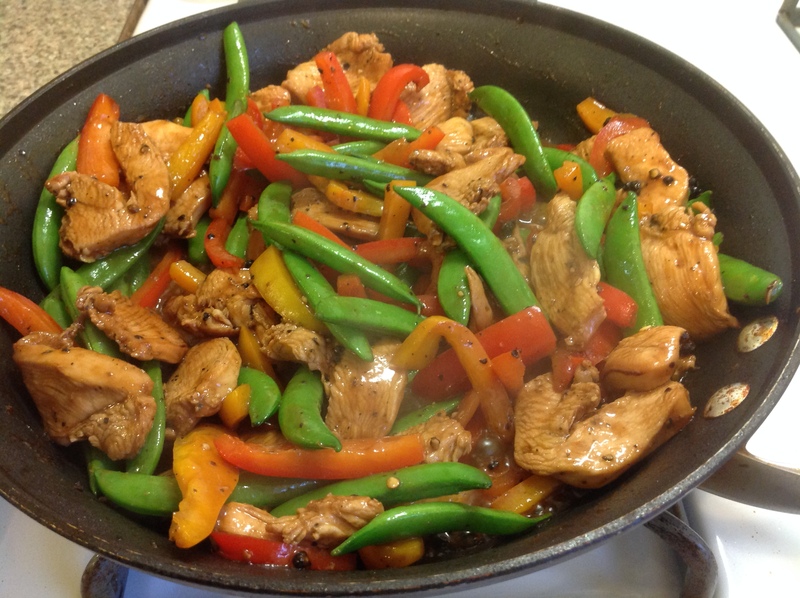 for Sam to take for lunch today – Peppered Chicken Stir Fry. This came from a giant cookbook filled with an assortment of recipes from all different cuisines. Chicken is mixed with ketchup and soy sauce and then dredged in crushed peppercorns. It’s pretty peppery, which I knew Sam would love. Serve it with rice for a tasty and well-balanced meal. The cookbook challenge has begun! Heat up a large skillet or wok over medium heat with a tablespoon of oil. Thinly slice your chicken breast and mix it with the ketchup and soy sauce. Toss in the crushed peppercorns and mix it all together. When the oil is starting to shimmer, add your chicken breast slices and stir fry for a few minutes until no longer pink on the outside. Add your sliced peppers and snap peas and stir. Cook for another 5 minutes. Add the oyster sauce and allow it to cook for another 5 minutes. Remove from heat and serve with brown rice. Earlier this week I took a step out of my comfort zone and told a guy that I could cook for a party of 30 people out of his small galley Boston kitchen. I had been automatically rejecting previous offers to cook for parties that big because I figured it was too big for just me to do, but then I got involved in talking to him and I figured I couldn’t back down. Long story short – it went amazingly well. People were asking for my business cards (gotta get on that), complimenting me on the food, and expressing surprise that I had made everything myself. I must confess that I couldn’t have done it without Teresa. She was hired separately to help clean up during the party and she was an amazing asset – she helped assemble dishes, take food out of the oven, and clean dishes while I cooked. Without her I would have been there all night and I would have been a lot more stressed about it. I’m very happy with how the night turned out and am grateful I had (and took) the opportunity. At the end of the night I swore I wouldn’t go anywhere near the kitchen for the next few days, but after a good night’s sleep I felt more refreshed (not ready to cook for another party of course). 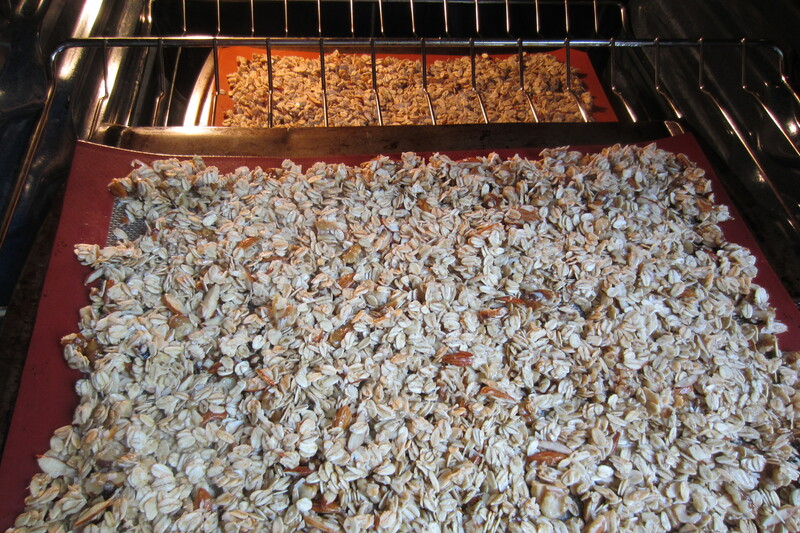 Since we needed more granola and it doesn’t take too long to make I made some of my favorite breakfast staple. I have adapted the recipe each time I make it, but I have found a few different recipes that I am very happy with. I find in this humid weather though the hardest part is getting it crunchy enough without burning it. The following is an adaptation of a recipe from my aunt in Hartford. 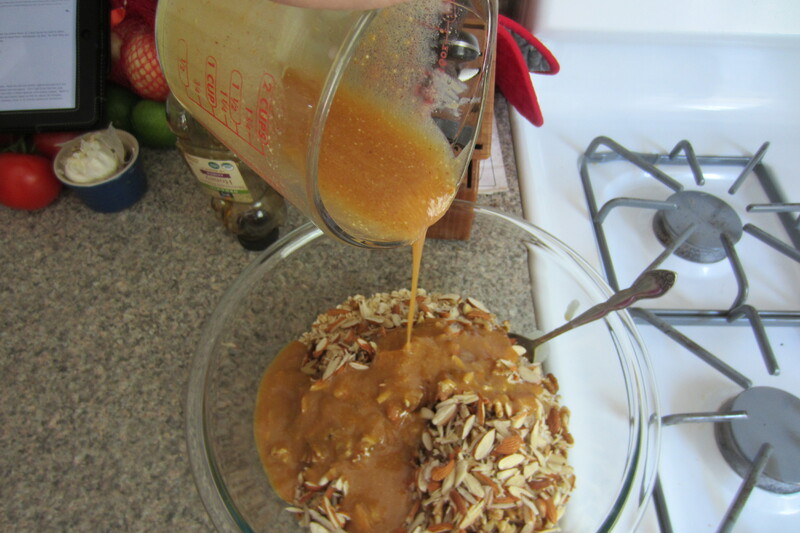 You can use any kind of nut butter and any kind of dried fruit (or leave it out and use fresh fruit). It’s very easy to make and is a great snack. 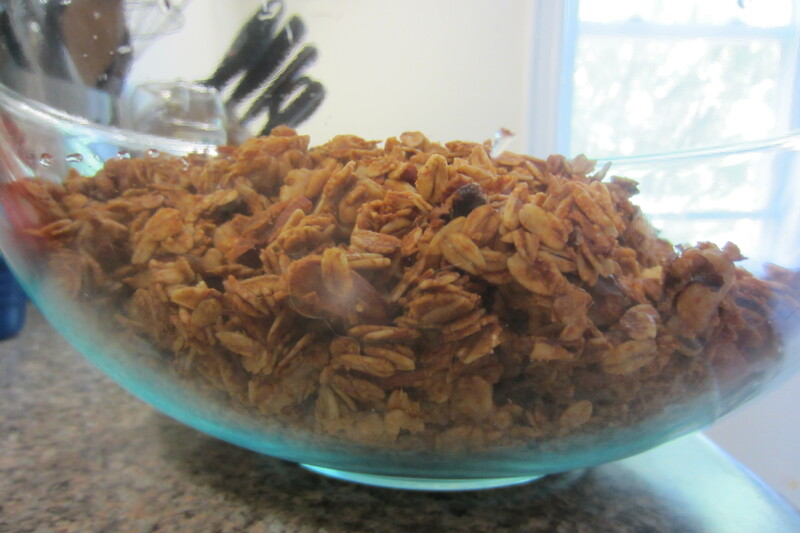 Granola is also relatively flexible so you can easily make substitutions or play with the amounts of dry ingredients if you want it sweeter or something. 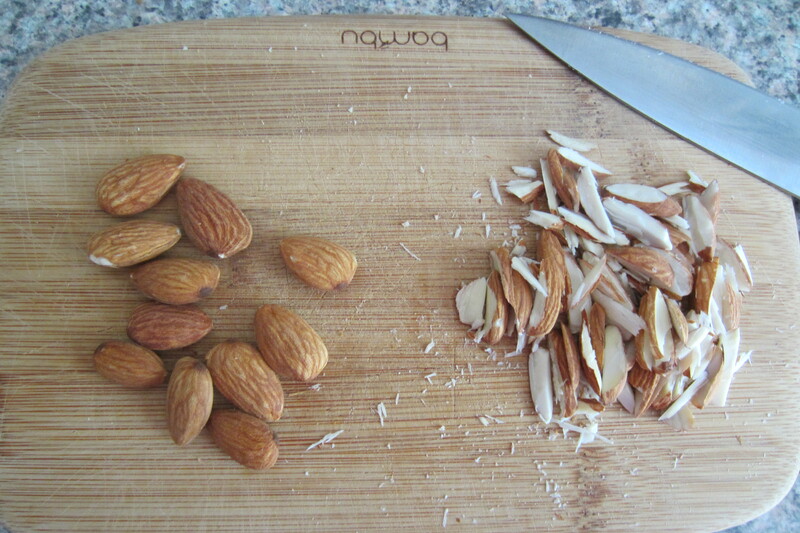 Because I like my almonds chopped and I already had whole ones, I cut these up, though you could use whole or chopped. 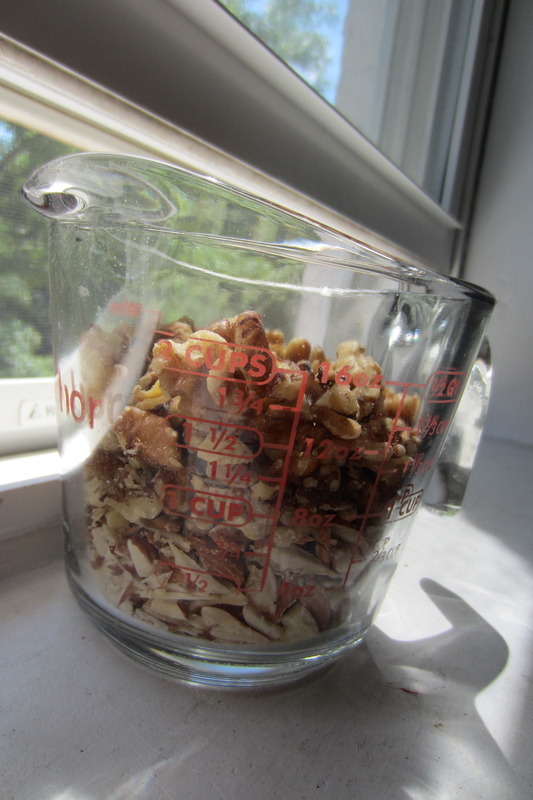 Measure oats, coconut and nuts into a bowl. 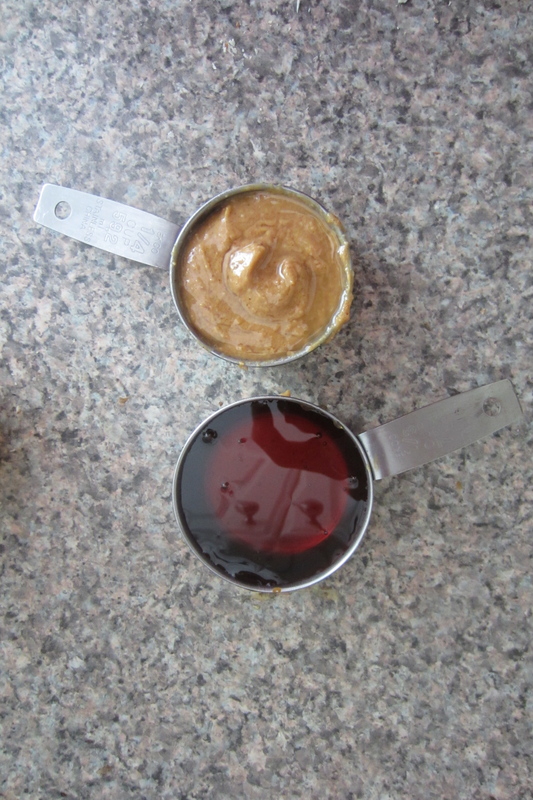 In a separate bowl, measure oil, nut butter, and honey with a splash of water (1 Tablespoon). Stir well. 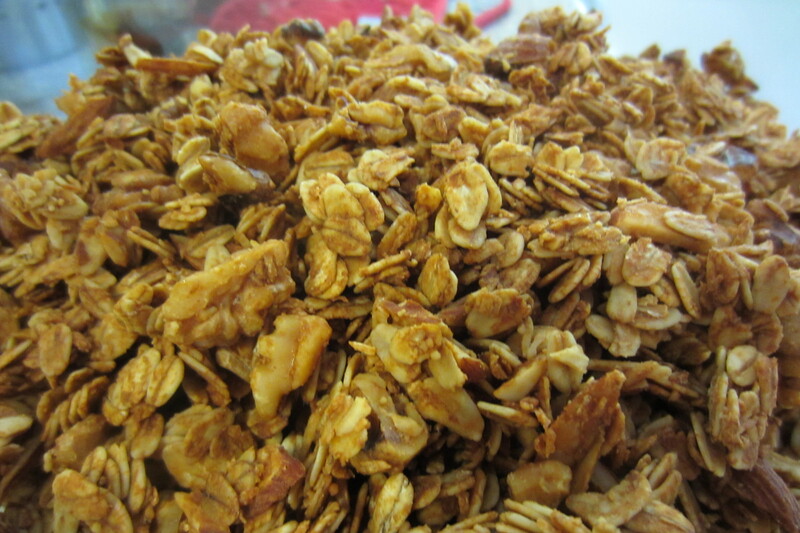 Drizzle over oats and stir well to coat. 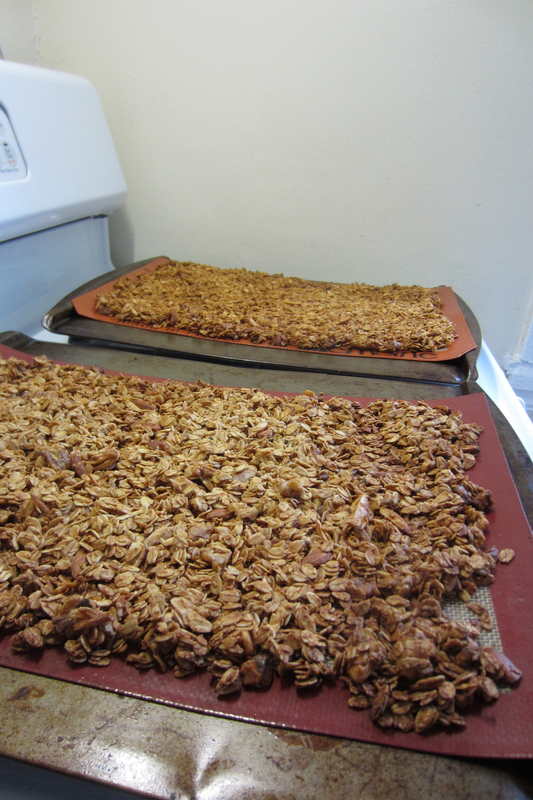 Bake at 275 on parchment paper lined sheets for 20 minutes. Switch the sheet pans for even cooking and bake 20 minutes more. Remove and let cool. Stir in your choice of dried fruit if desired and store in an airtight container. 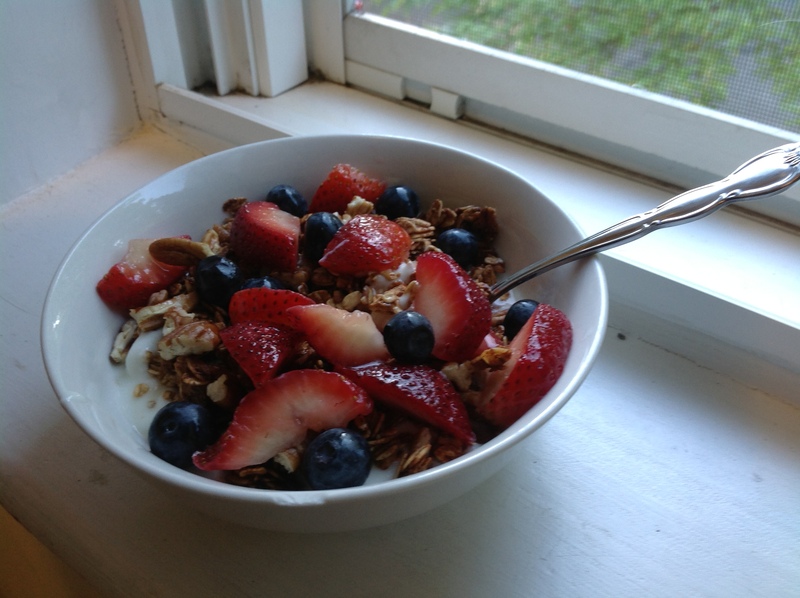 Enjoy with yogurt and fresh fruit or as a quick snack. 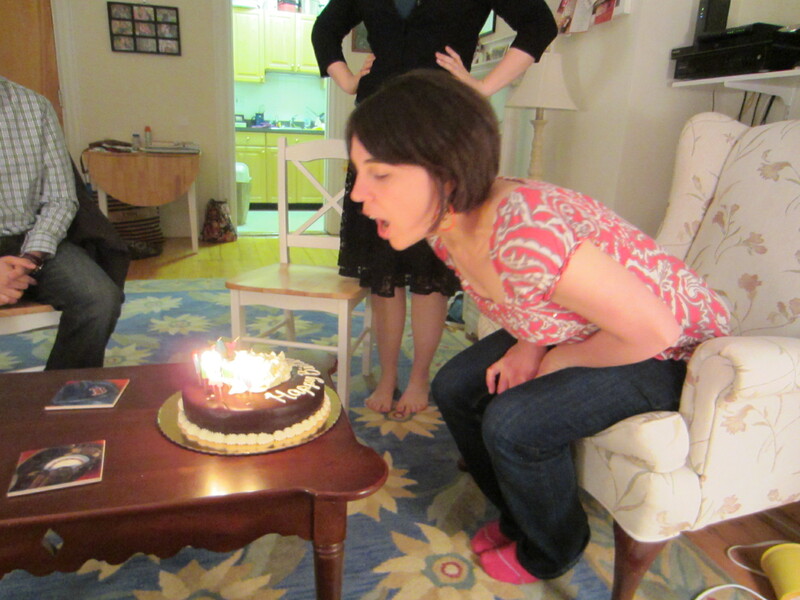 Yesterday I turned… one year older (you can’t just tell the whole internet your age!) and I can feel it. No my bones aren’t aching nor my knees giving out. I feel it in the sense that time is sprinting right by me. I feel it in the sense that I should be living for what I love and seizing opportunities. Time really does disappear too fast. I remember waiting with my sisters on Christmas morning until we were allowed to wake up our parents to open presents. We’d look at the clock. 2 minutes gone by. We’d play some cards, look at the clock again. 5 minutes gone by. Five minutes is FOREVER, we thought. Now a week disappears in a blink and “wasn’t it just last Tuesday?” becomes a phrase in my life connecting all similar moments as if in one long string. Every Tuesday is just a continuation of the previous Tuesdays, as if no time passed in between. Like a movie reel the tape just keeps on rolling. Wasn’t I just having a birthday like a year ago? (Uh yeah, you were.) But somehow it didn’t seem like that long ago. 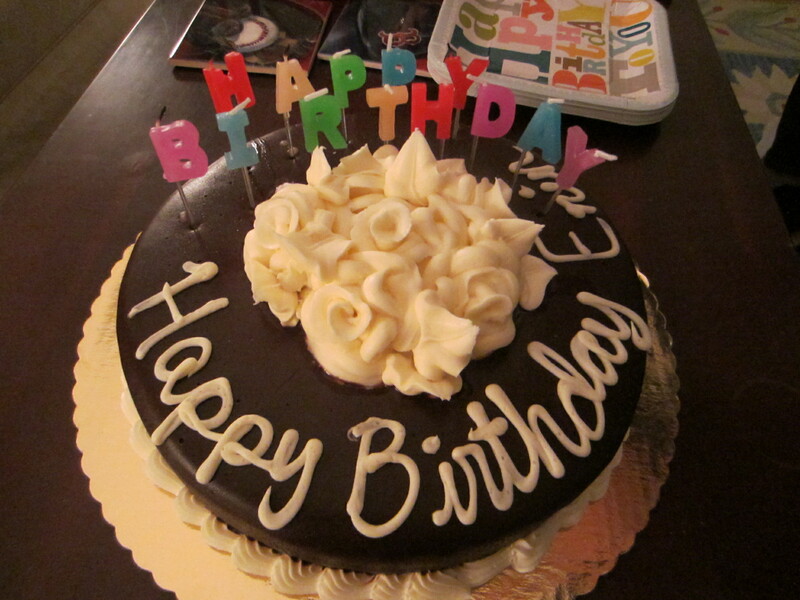 I have to admit that I wasted much of my birthday being grumpy. The weather in Boston was un- May-like -ly (how’s that for a made-up word?) cold and drizzly and I was supposed to be packing and measuring our new apartment and a couch to see if it fit. Birthdays are supposed to be for fun, I grumbled to myself, not for responsibility. As I get older I realize more and more that birthdays are for taking action (instead of making wishes) and for counting the lucky stars in your life that are there to celebrate with you and to tell you to shape up when you get grumpy on your own birthday (thanks. You know who you are). 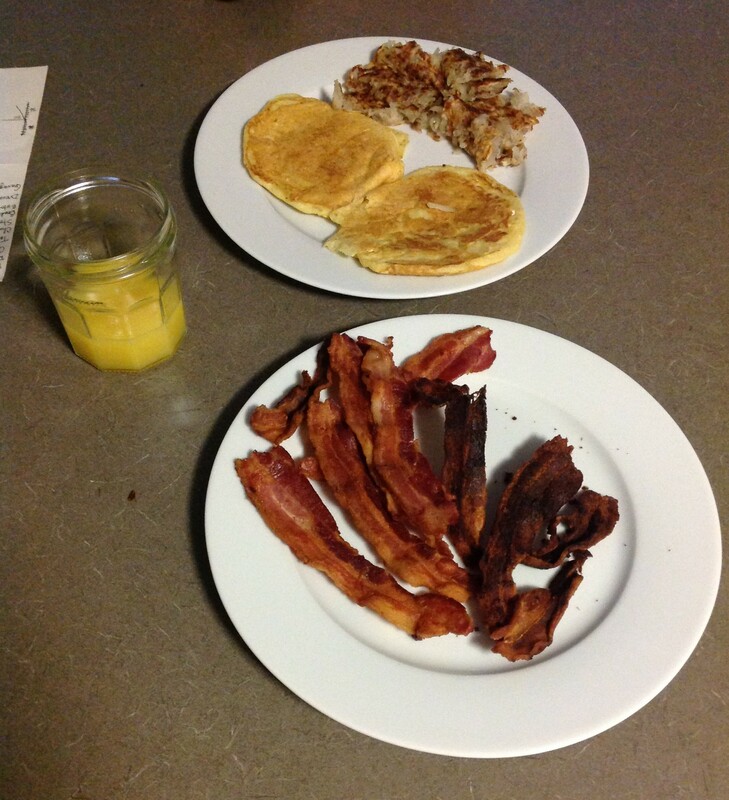 Speaking of lucky stars, my number one lucky star made me a surprise breakfast this morning (photo credit to him): hash browns, pancakes, and bacon. And I am ever so grateful for my wonderful friends who got me a beautiful Chocolate Mousse Decadence cake and celebrated with me over a delicious dinner at the Elephant Walk! To the credit of my friends, the day did start and end well, but I realized too late in my grump-slump that I needed to change my own attitude. Having a birthday is a reason to celebrate, but also a chance to reflect. If a year can go by this fast, just imagine the next year and the next. What do you want to be doing? When you look back in five years, where do you want to be? (I know, I know, I used to hate this question too and I don’t like spouting cliche phrases) but I have to remind myself ALL THE TIME – do what you love and do it now. I highly recommend this book for reflecting on this in detail. Oh ok, you want a recipe. Well in honor of birthdays, here are two for my favorite chocolate frostings. WARNING: the first one is very buttery and sweet and rich and delicious and it takes a bit of time to make, but the second one is also delicious and much simpler to whip up. Happy Birthday to me! (or to you if you’re reading this on your own birthday). Make it a day of gratitude. Place a large bowl in the sink and fill with ice about half way. Make sure it is bigger than the saucepan you are going to use in the next step. In a saucepan (see previous step) pour chocolate chips, half-and-half, and butter and melt over medium heat. Stir constantly until it melts and the mixtures thickens, about 5 minutes. Do not let boil. Remove from heat. Use as desired for cupcakes or cake of your choice. The frosting will stiffen up as it sets. If it gets too hard to spread, place the saucepan back over low heat for a few minutes. Beat softened butter with an electric mixer, Kitchenaid, or by hand. Beat in cocoa powder. Slowly add powdered sugar, vanilla, and a bit of milk. Add as much sugar and milk as needed to reach the right consistency and taste. (To be honest, I don’t usually measure the ingredients for this these days).